Dragonlord is a 6-star unit that plays the Magic Attacker role. He has a pretty good HP pool for a magic character and he may look like he lacks a bit at first glance but he’s actually pretty good. Dragonlord only has 8 active skills in total. No magic even though he is a magic attacker and it’s all because he covers everything he needs to with his skills. 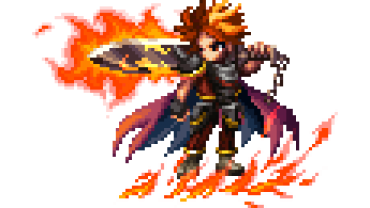 He mostly has coverage over Fire and Lightning with two attacks each but also a Dark element with one attack. He also has Snooze to inflict Sleep and dual black magic for dual casting. He also has two healing spells as well. One for HP and other for healing status so all around he’s pretty well set up for a lot of situations. What’s good about him is his unique trait Dragonlord’s Guard. It has a 50% chance to ignore fatal damage when below 40% HP. So having that little fall back when in a dire straight is really helpful, especially for a magic user. He lacks some skills and actual magic but with what he has he can deal some pretty good damage. Verdict: A decent magic attacker. Pretty good for Fire and Lightning coverage. Dragonlord is neutral to all elements and status ailments. Dragonlord can equip 4 weapons and 4 armor. you got the Dragonlord’s guard wrong in your comment. And he doesn’t have dual casting.